Civilization V Release Date for Mac is November 22? It looks like Civilization 5 for Mac OS X will be released on November 22, this is in line with the official release date scheduled loosely in “Fall 2010” that was announced previously by Aspyr. 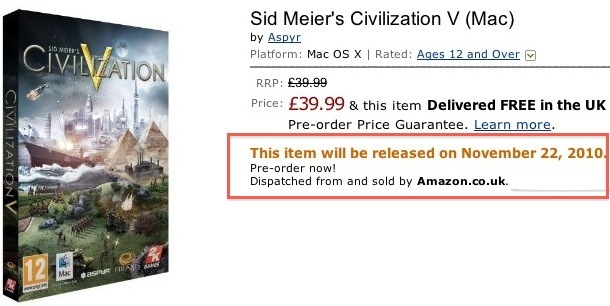 Update: you can now pre-order Civilization V for Mac from Amazon which includes free shipping. The precise release date comes from Amazon UK (screenshot above in case it goes down). Amazon has spilled the beans on other software and hardware releases in the past (iLife 11, Office 2011 for Mac , etc), so this should be considered somewhat reliable information. Currently the USA Amazon Store reveals a generic placeholder for Civilization V for Mac , which doesn’t have any release information, box shots, or artwork, only the “Currently unavailable” message. Thanks to Andrew who discovered this! Great, just in time for Fall Term Finals. My GPA is dropping already just knowing the release date.